Here on 71 North, it is dark almost 24h around Winter Solstice; only around noon do we see some twilight. 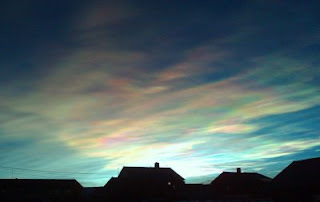 But sometimes light itself is spectacular, such as today when iridescent clouds coloured the southern sky. These clouds are typical for the polar areas and are formed 20-30 km up where the temperature is down to -80 Celsius.With light like this, who cares if it's dark the rest of the day? Selecting the appropriate bandwidth is a two-step process. Clicking "FILT" or the bandwidth label (in the case of the picture: "4K") opens a new window from which you can select one of 16 preset bandwidths. Each can be tailor-made to your own liking. I was somewhat surprised to see that in AM mode, "4K" bandwidth is not 4 kHz, but 8! 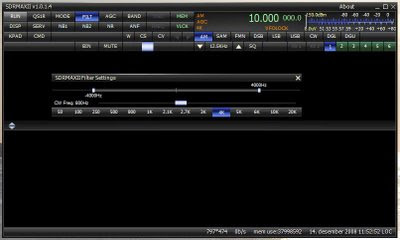 As long as you know, it's ok. Making a passband shift effect is easy enough; just adjust the slider on the bandwidth line. The bandwidth setting will reset to default if you press one of the bandwidth buttons on the bottom. Less elegant than the Perseus, but perfectly acceptable. I have no tools to measure the ultimate rejection of these bandwidths, so a comparison between the QS1R and the Perseus had to be made with ears only. 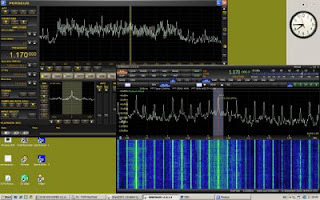 I could not detect any difference between the two SDRs. As we know, audio quality relies on a well designed AGC function. The QS1R GUI offers Long, Slow, Med, Fast AGC, or you can choose to turn it off. The settings can be adjusted the same way bandwidth can - at least in theory. The current GUI has the AGC options greyed out but the problem has been acknowledged by Cathy the GUI designer so I expect the option to be available soon. 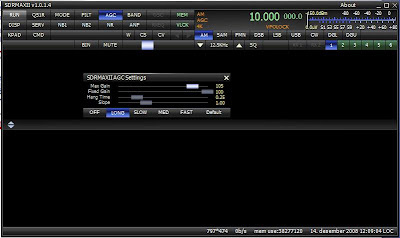 At present, even the "Long" AGC setting has a too short release time to cope with rapid fading. In such instances, "pumping" effects will be heard. But audio quality and audio recovery is nonetheless superb. In situations with heavy interference, the weaker signal often appears more readable on the QS1R than on the Perseus. The difference is subtle, and the average listener may not detect it at all, but in some cases it could be the difference between hearing an ID or not. Audio recovery appears to be more "open" than the Perseus, making it easier to separate between several stations on the frequency. Another most wanted station arrived with the superb conditions I experienced on Sept 27 and 28, and with a very good signal too. Brief email today confirmed my reception. At the same time, relatively rare CKGL had a monster signal on 570, so Ontario stations were really getting out those days. Got my QS1R today. Although I have heard of others having trouble installing it to a PC with Perseus, I decided to give it a try. Absolutely no problems at all! CPU load on my dual core 8400 processor is around 15% Perseus, 6-9% QS1R server and around 15-20% for the QS1R GUI (SDRMAX II). What a wonderful new toy. Phil, I hope you have the recording function up and going soon. More as I explore the QS1R, and compare it to the Perseus. September 27 and 28 proved to be excellent dates for eastern North America and also Central and northern South America DX. WGR is a most wanted station and they surfaced on one half-hour with excellent signal and an ID to match. Next target on 550: WKRC.